Three couples who have known each other for many years took the opportunity for a holiday together at a gite in the Dordogne. Here's an article one friend wrote on their 'perfect day'. "I surfaced from my comfy bed, slightly disorientated as the room was still cool and dark. Only birdsong had penetrated the shutters. The guilty pleasure of a long lie-in had been impossible to resist but I was eventually tempted out by the aroma of fresh coffee - one of my housemates was obviously a few minutes ahead of me. One friend was already making the most of the pool which was a bit energetic for me, but I prepared a pot for the tea drinkers I could hear surfacing and set off to the end of the road to collect the croissants and pain au chocolat for breakfast. A very civilized way to start a leisurely day. The day before we had enjoyed a wonderful lunch at la Taverne in Le Buisson; a small family run restaurant, very popular with the French workers in the town, which is always a good sign, and the recommendation had come with a warning to get there early. Five courses, including wine and coffee for €14. Fantastic value and a very enjoyable, tasty meal in a relaxed, informal atmosphere. We’d have gone again but we ran out of days. On this day, we were definitely moving at holiday pace and finally set off from our house at very late morning towards Monbazillac. Lunch was booked at La Tour des Vents. Perched on a hilltop, surrounded by vineyards and overlooking the Bergerac valley, this had also been recommended to us, but we hadn’t asked many questions and so didn’t have much idea what to expect. First impressions were very good - beautiful setting, friendly welcome, attentive service but it still felt relaxed and informal. 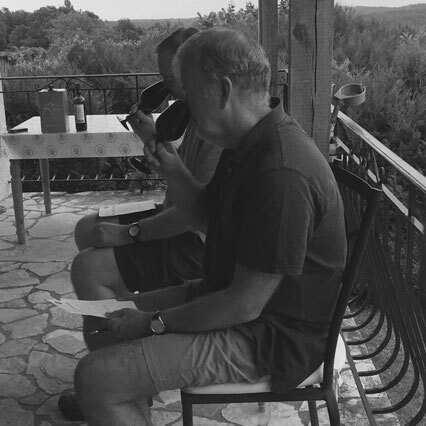 We all plumped for the €44 menu; the two lightweights in our group volunteered to drive and after the normal jokes about who should choose the wine, conversation bubbled along as it does when a group of people who’ve known each other for more than 30 years get together. Couldn’t fault the meal even if I’d wanted to. We oohed and aahed over exquisite explosions of taste, took photos of the beautifully presented food, argued good-naturedly over who’d made the best selection from the menu and wiled away almost three hours in comfortable bliss. We thought it might be Michelin starred and it turned out we were right. Replete we headed back to our house; some for a swim, some for a bit of sunbathing and others to read books through their eyelids. We’d booked a wine tasting session as a finale to our day. 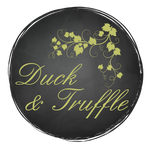 Max and Emma from Duck & Truffle arrived early evening with glasses, an array of wine bottles and armloads of nibbles. We like wine, we’ve been drinking it for years but I’ll admit (even if some of the others won’t) that we don’t really know anything about wine. There were 8 wines to try: white, rose, red, dessert and mystery. It was informative, but not pretentious. We had fun guessing the retail prices, which gave plenty of opportunities for ribbing “the big spenders”. The mystery wine presented in a black opaque glass had some of us stumped for a bit so we had to taste it again, and again. Max and Emma bid us farewell and left us to mull over our favourites. We compared scorecards while we attacked the nibbles and then re-tasted the wines to see if our palates had changed. And then re-tasted our favourites just because we could. Over a long, relaxed evening we tested the wines thoroughly, re-tasting them after pate, cheese and chocolate. Some of the wines divided opinion, some were coveted by all. All agreed it was a wonderful way to round off a perfect day."